Everyone sweats, but showers aren’t always practical. 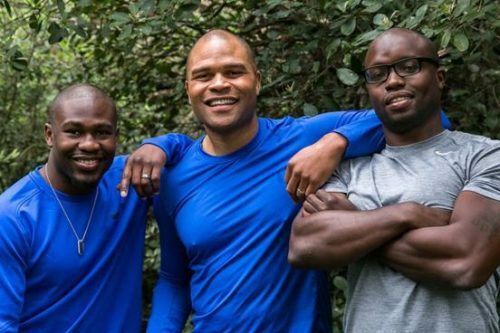 Wendell Hunter, Justin Forsett, and Wale Forrester created ShowerPill to help everyone, from professional athletes to moms-on-the-go, stay fresh and healthy after they work out. The three University of California Berkeley college football teammates, two of which played in the National Football League (NFL), pitched their wipe that works like a disposable washcloth on ABC’s Shark Tank. 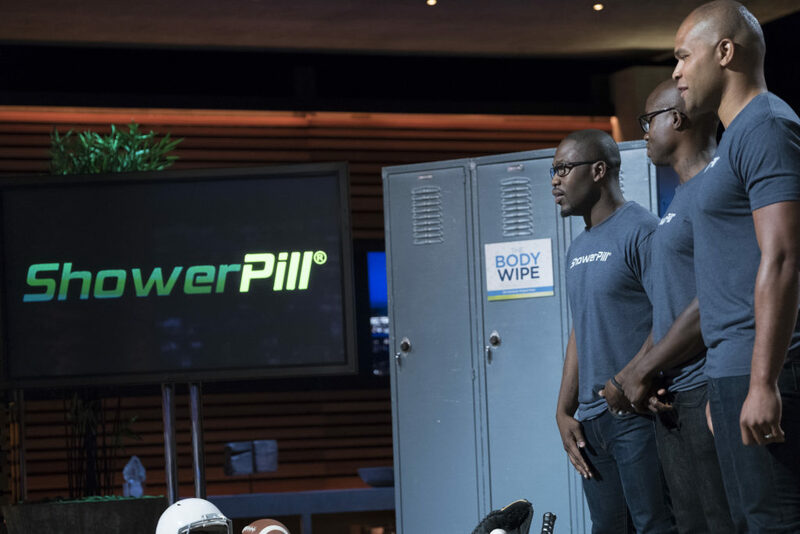 After the show, Brandon Andrews sat down with ShowerPill co-founder Wale Forrester to discuss the show and their business. Brandon Andrews: ShowerPill? What does the name mean? Are athletes not showering? Wale Forrester: To this day, it’s an inside joke among athletes that a teammate who skips a shower–often due to time constraints–is taking a “shower pill.” As three college football teammates at Cal-Berkeley, we found that showering every time we broke a sweat just wasn’t a realistic option. Our teammates were dealing with the same problem, which was more than just a body odor issue. The health implications were real; guys were contracting and spreading sweat-related infections. That’s why the CDC recommends that you shower immediately after skin-to-skin contact and perspiration. And that’s why we set out to turn the “shower pill” joke into a hygiene supplement solution. After identifying the problem, how did you create the product? What advice do you have for other entrepreneurs looking to bring their idea to market? Drawing from our own experiences, skill sets and relationships, our goal was to create a medical-grade disposable washcloth that kills 99.9% of germs and removes dirt, sweat, and body odor. When we decided to move forward with this business concept, I was working as an Oakland firefighter, using every spare moment to bring our idea to fruition. Our co-founder Wendell Hunter was working as a hospital ER tech, with a keen understanding of CDC recommendations and sanitation products. Our other co-founder, Justin Forsett, was playing with the NFL’s Seattle Seahawks, which eventually became our first test market. We worked with contract manufacturers, chemists, scientists, team doctors, athletic trainers, and pro athletes to develop a high-performance, quality product using only premium ingredients (and none of the bad stuff). Our advice to other entrepreneurs looking to bring their product to market is to actually solve a problem for the consumer. It sounds simple, but it’s something many entrepreneurs lose sight of. And truth is, if something is a solutionless problem for you, it’s likely a problem for many others too. That’s your market. You have deep connections to the world of professional athletes. How did you begin penetrating the consumer market? What was the strategy? It quickly became clear that there was a whole consumer base outside of the locker room. We’d been overlooking the busy mom who squeezes in a spin class, then bolts to pick up her kid. And the businessman who CrossFits during lunch and quickly heads back to the office. There’s the runner, golfer, yogi, cyclist, and everything-in-between fitness enthusiast who wants to crush their fitness goals and keep their hygiene in check. So we implemented a push marketing strategy, sampling at the “point of sweat.” As our product addresses the post-workout need state, it allows us to sample without much explanation. We partnered with boutique gyms/studios without showers and relay running series that didn’t have onsite showers for participants. Once these communities saw a need for our product, they became loyal customers. And it’s grown organically from there. You appeared on Shark Tank! 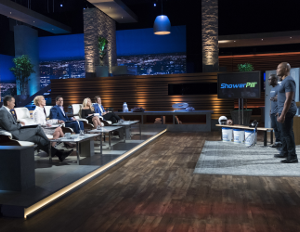 How did you prepare to pitch your business on the show? We started out by brainstorming and preparing to answer all possible questions the sharks might ask us. Then we began working on our pitch, tweaking it here and there as we practiced. We held mock Q&A sessions and filmed our pitch to give ourselves as close to a dress rehearsal as possible. But once you’re under those lights and the cameras are rolling, it’s a whole different ballgame. What did you learn from your appearance on the show? Looking back, is there anything you would have done differently? We learned a lot, but a noteworthy lesson was the importance of delegation. Since we are all equal partners, we typically split tasks up three ways. But since taping the show, we have placed ourselves into our natural positions and adopted an equity model as opposed to an equality model. We also learned the significance of editing. We were in front of the sharks for much longer than our eight-minute segment that aired on TV. Let’s just say that it didn’t work in our favor. But we have no regrets. It was an incredible learning experience, professionally and personally. Since taping the show, we haven’t taken our foot off the gas. Aside from an increase in sales, we have assembled a dream team, with experts in finance, e-commerce/sales, graphic design, and PR. We relaunched our website and redesigned our packaging. We traveled to Puerto Rico to personally deliver the first of 20,000 body wipes to residents in hurricane-ravaged areas without access to clean bathing water. We launched in Crunch Fitness, Pharmaca, and UFC gyms. And we aren’t slowing down anytime soon. How do you plan to grow the business in 2018? More distribution. We are currently raising money and plan on securing three big box retailers and four more national gym chains this year. We will also scale our direct-to-consumer model and launch four new products. Since day one, we set out to become the Gatorade of hygiene…and that remains our ultimate goal. You donate your product to places impacted by natural and man-made disasters like Flint, Michigan and Houston. Why is giving back important to you? Is it a benefit to your business? ShowerPill is a mission–to inspire and empower people to live their best lives–that just so happens to be a business. We believe that God has given us this platform to give him glory, and serve the people that he loves. We believe that the cornerstone of our mission is grounded in our company’s commitment to give back…a non-negotiable component of what we set out to do since day one. Through our #Shower2ThePeople initiatives, we are proud to provide support and relief to communities worldwide.